Leap! And love will catch you. More than once in my life, I’ve found myself digging through dusty baskets of old photos in the back corner of an antique shop in a town I’ve never visited before. I find wedding portraits, children on tricycles, scrawny young shirtless men standing on outcroppings, their hips cocked, cigarette in one hand. I know better. I know better. But I keep expecting to find a picture of someone I recognize. I never have, of course. But occasionally I buy the picture because the image, the person, the face is so compelling. Before I know it, I’m convinced I can read her mind. Whether someone has penciled it in script on the back or not, I know his name. I can tell you who she killed. I can tell you how he got away with robbing that bank. “You ready to go?” My husband asks me, which shakes me back into reality. Nine times out of ten, I put down the photo and the bank robber and murderess settle back into their dusty basket. But that tenth time, she comes home with me. She’s going to be a character. She’s going to live a new, double life in pixels and on paper. 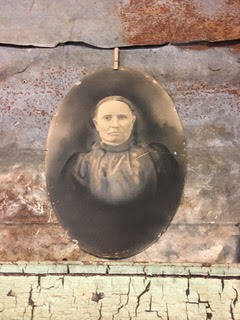 If you’re ever in the back of a barn in southern Missouri, you may meet this fine matron. Don’t laugh too loud, or dance too wildly, or drink too much where she can see you. And if you do so anyway, be ready to get The Look. She was a master at The Look in life, and death hasn’t slowed her down one bit.